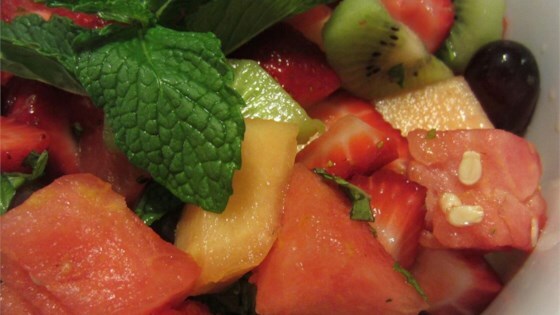 "A simply elegant fruit salad paired with a sweet and tangy lemon-mint dressing"
Combine watermelon, strawberries, peaches, nectarines, pear, and grapes in a large mixing bowl. My family loved this, I was concerned that it might be too minty but they thought it was just right. My wife said It has just the slightest hint mint which gave this a real fresh taste. Incredible dressing! Have used this many times now. I change up the fruit every time but keep the dressing exactly as written. So fresh and delicious. Thanks.